Surprisingly, some fancy (and pricey) cheeses are easy to make, even for beginners―especially if you have a good teacher. 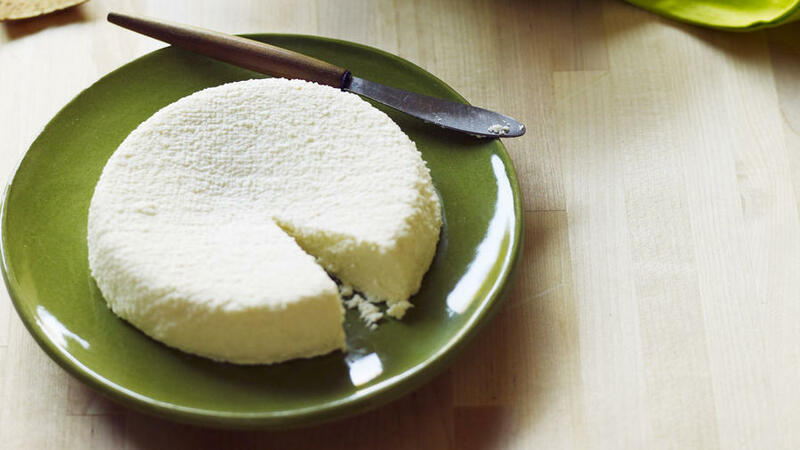 Two of the country’s top cheesemakers, both in Northern California, invited us into their warm, milk-scented creameries for hands-on cheesemaking sessions. Cowgirl Creamery, renowned for its Red Hawk and Mt. Tam cheeses, among others, explained how to create smooth, creamy fromage blanc―a French-style soft cheese. Bellwether Farms, which turns out glories like Pepato, Carmody, and Crescenza, revealed their technique for making real ricotta. And now we’re sharing their secrets, adapted to the home kitchen, with you. Set a 20-qt. canner on the stovetop and insert canning rack upside down (handles down). Fill canner with water to 1 in. below top ring. Bring to a boil, covered. Fill a sink with cold water (this will be your cool-down spot should you need it). Set an empty 8-qt. pot on upturned rack in canner (it will float a little). Pour whey if using, milk, and salt into pot and insert dairy thermometer into milk mixture. With a large slotted spoon, stir milk 20 times with a gentle surface-to-bottom circular motion to evenly distribute heat. Let milk heat over high heat, covered and undisturbed, until its temperature reaches 192° to 194° (water will be boiling), 30 to 40 minutes; adjust heat to maintain temperature. If milk starts to get too hot, cool it in sink of water. Slowly pour vinegar over the warm milk. With a slotted spoon, stir milk 20 times with a gentle surface-to-bottom circular motion. Small curds will begin to form (they may have already). Cover pot with canner lid and let mixture stand, undisturbed, over high heat 25 minutes for curds to finish forming (temperature should remain between 192° and 194°; check occasionally and adjust heat as needed). Meanwhile, line mold with a double thickness of cheesecloth, trimmed to hang slightly over rim. Set a cookie or biscuit cutter in a medium bowl, then set mold on top. Gently ladle curds and whey into mold, occasionally pouring out liquid from bowl, until draining slows down to a trickle. Smooth cheese in mold so it’s level. Cover bowl and mold with plastic wrap and chill. Let curds drain in refrigerator until there are no visible pockets of liquid (curds should be moist), a few minutes to about 30 minutes more. Wrap mold and cheese tightly with plastic wrap (or, if you’re using a colander, transfer cheese to an airtight container). Your ricotta is ready to eat. It keeps, chilled and wrapped airtight, up to 4 days. To serve, invert mold onto a plate or just spoon cheese out of container. Makes 1¼ to 1½ cups (3½ cups if you use all milk). Per ¼ Cup: 108 Cal., 66% (71 cal.) from fat; 7 g protein; 8.1 g fat (5.2 g sat. ); 2 g carbo (0 g fiber); 52 mg sodium; 32 mg chol.